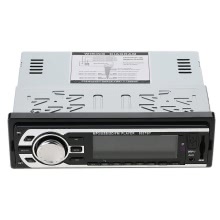 It is a single-din audio system that not only takes you on a musical journey but also gives you the freedom to connect various external drives to it. You can listen to FM and AM frequencies clearly and play MP3 and WMA tracks. Built-in blue tooth and microphone, support hands-free calls and audio streaming, making you convenient to receive calls and safe to drive. Compatible with mobile phone devices, support SD card, USB charge and MP3 players etc. Built-in blue tooth and microphone, support hands-free calls and audio streaming. Making you convenient to receive calls and safe to drive. Large-screen, clear and bright, dynamic. 4-channel high power output with 4 loud speakers.